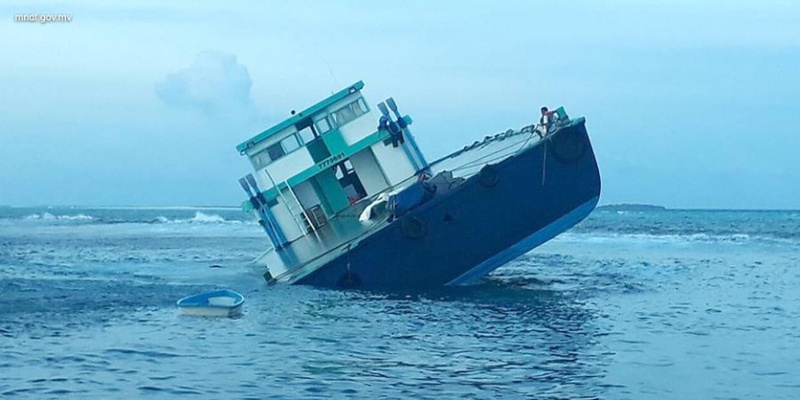 The boat, D Blue Carrier, which was travelling from R. Muravandhoo to Male’ City has wrecked on a reef. Maldives National Defense Force (MNDF) reports the D Blue Carrier is a 98-foot supply boat. The boat wrecked on B. Vandhoomaa Reef, which lays to the South East of Reethi Beach Restort. MNDF said the incident was reported to the authority at 1:55 am this Tuesday morning, and that a Northern Area Coastguard speedboat with Coastguard divers was immediately dispatched to the area. There were four people onboard when the incident took place; three foreigners and one Maldivian. MNDF confirmed no one was harmed in the incident. The authority said Coastguard divers are assisting in removing the boat off the wreck with the help of a boat arranged by the owner of D Blue Carrier.